Written specifically for executives and MBA students, the third edition of this successful textbook provides a step-by-step guide to designing an organization, from diagnosis, to design and implementation. 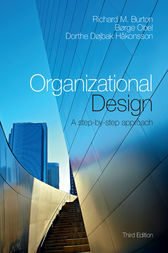 It provides comprehensive coverage of the key aspects of organizational design, including goals, strategy, process, people, coordination, control, and incentives. Following a new diamond model, fully tested in practice, the book guides readers through an integrated methodology for organizational assessment and planning. It includes a new chapter on project managing organizational change on a practical level, new case studies, extended discussions of new organizational forms, architecture design and knowledge systems, and new practical steps for implementation and change. Visit www.cambridge.org/burton3 for free access to a selection of organizational diagnosis, design and implementation models in Excel, as well as additional case studies, figures and tables from the book.